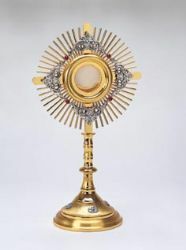 You would expect this monstrance to be twice the price. It features two tone gold plated with oxidized silver medallions on the base and filgree on face. Four ruby colored stone on the face. clip-style (glassless)luna, holds any size host up to 3". Ht. 21", 11 1/2" face, 7 1/4" base weighs 5.5 lbs.